Collaboration between Gems and John Theroux on visuals. Please enjoy!! New Music up on Youtube! Pleased to share our most recent video/music collaboration with the great saxophonist Jessica Lurie. Enjoy!! New Music on our youtube channel! Cassette Tapes of Night Music Now available…limited release!!! 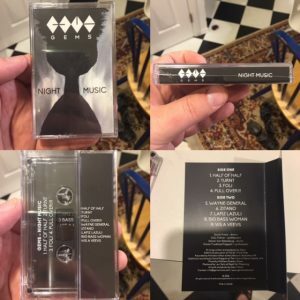 Super limited release of "Night Music" cassette tapes!!! Once they're gone...they're gone! We recorded the record directly to tape and so we're very happy to offer it on an analog medium! Head over to our store page to purchase. Happy to announce the first song/music video from our upcoming new record "Night Music" out this summer!! Enjoy and share! !